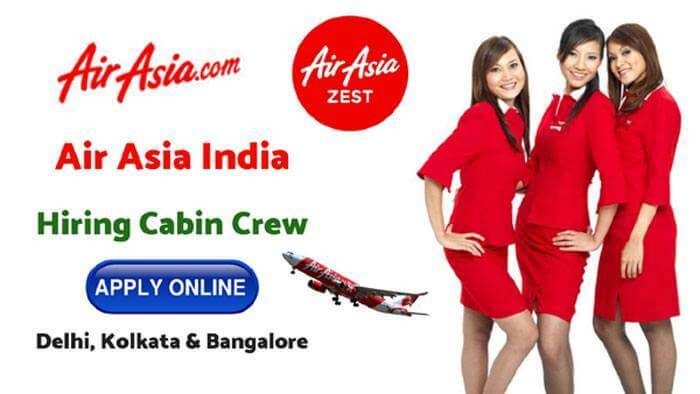 Air Asia India – do you want to become a cabin crew or flight attendant in India? if yes then this article for you only. Just you need to read this article till the end to apply online correctly. So, friends in today’s article I am gonna write on the topic of Air Asia India Hiring Cabin Crew for Delhi, Kolkata, and Bangalore. Welcome to Aviation Dreamer. Here you can Search your favorite Aviation Jobs, Airlines Jobs or Pilot Jobs, also you can get excited Aviation Interview Tips for Cabin Crew Jobs or Ground Staff Jobs. Maintaining a fully working knowledge about the scheduled cabin crew emergency drills and procedures in the Safety Emergency Procedure (SEP) Rules. In the event of an emergency, he is responsible for the commander to implement relevant procedures and emergency practice. Report to the SCC / Commander any such incident that may have been in danger or that could jeopardize the safety of the operation. Be sure to maintain a high standard and good presence in the public at all times. Ensure that all galley equipment, catering stores, dry stores, and lost equipment are properly and securely stored on the board. All the companies are fully acquainted with aircraft equipment, catering stoves, and passenger comfort equipment and their operation. Height requirement : Female – 157 cm & Male – 173 cm. Clear Complexion & weight within prescribed BMI. After shortlisting the resume of the applicant, the airline will be informing for the interview and the interview will be held at Bangalore. So, just you need to share your resume and picture. Note – Air Asia India is not directly or indirectly employing any third party vendor or agencies. Your selection will be fully on the qualification and performance on the evaluation during our interview process.